Holy cow! I really just want to buy some peaches. Nice, sweet juicy, peaches. * I bought them last week and they were perfect — SMALL (doctor-approved size), scrumptious, mouth-watering, delights. Today, I decided to treat myself to a few more for the upcoming week. I try to eat what’s local, and this is peach season. I guess the season snuck out as fast as it came in, because those afore-mentioned fruits were nowhere to be found. I went to two food stores, one farmer’s market, and one small, local fruit/vegetable store — “Where are they?”– I asked. “Right over there,” I was told. Right over there sat a box of gargantuan, ginormous, HUGE, peaches (At least, that’s what the sign spelled out — P-E-A-C-H-E-S). 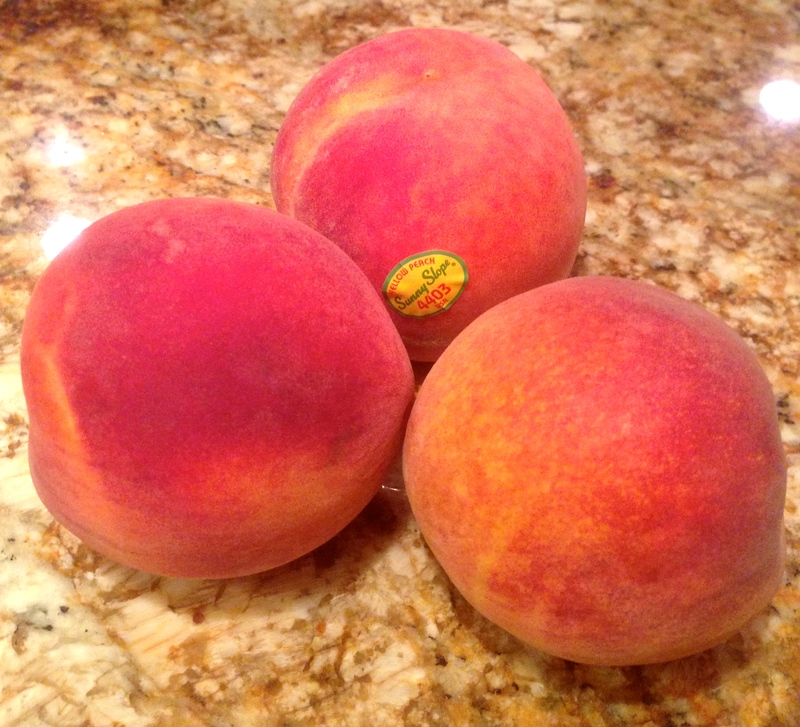 I picked up one of the larger-than-baseball-sized “peaches.” It was hard as a muscle-breaking rock, and just as heavy. I smelled it, hoping to get a whiff of that usual, glorious, sweet, aroma of the peach. NOTHING! It smelled like nothing. How sad. I returned home, empty-handed. During the drive home, I questioned how this could have happened. Steroids! I decided. That has to be it. The skin had the feel of peaches, the fuzz, the coloring was sort of right, but they were inflated. I felt overcome with grief. What are we doing to our planet? I asked my sad self. The answer seemed obvious. They (the farming community?) must think bigger is better. But only a week ago, the peaches were soft, some slightly firm, colorful, fragrant, juice-filled balls of joy. Again, I queried myself, “What could possibly have happened to that wonderful harvest?” My conclusion: When the perfect harvest is complete and delivered to market, they must inject the leftovers with chemicals, STEROIDS!… leave them on the vine for awhile. Then, after a growth spurt, they bring the remainder back out to sell. Tears welled up in my eyes (well, kind of). I decided to Google “hard peaches” to see what I’d get. See above for a link on how to ripen them. Good luck. I’m saddened that they would pick those fabulous treats and bring them to market before their time. C’mon, folks, let nature take its course. I’ll have to try Whole Foods, maybe there’s hope. Whatever the “real” answer is, I feel robbed. Next > BAKED ZUCCHINI “FRIES” — Amazing! There are so many varieties available it seems impossible to find the delicious peach you just had a few days ago. I went in search of a normal size peach recently and all I could find were those Large and very hard peaches, so I aked a farmer friend and she listed off early, mid and late season varieties, along with yellow or white flesh, and the flatter peaches meant for baking, I was dizzy after our talk and I bought a few plums. What I learned years ago is many stone fruits are picked before fully ripe because once picked they continue to ripen, I have always placed in a brown paper bag and usually a day or so and the fruit is ready. Your local shops should have a smaller variety in a week or so. Enjoy. Thanks Deborah for your comment. It was most enlightening! 🙂 Hope you’ll continue to follow along. kkeevins on HAPPY NEW YEAR!! !